Kiev, Ukraine – Square and simple. Red bricks. Five flights of stairs. No elevator. Branches and dry leaves climb along the facades, between balconies. The structures are drab, dreary, bleak, dilapidated. They all look the same. The bulk of the Ukranian capital’s housing stock dates from the times of Soviet leaders Joseph Stalin, Nikita Khrushchev, and Leonid Brezhnev. These housing blocks – containing dozens of apartments with four to six square-metre kitchens, thin brick walls, midget hallways and one to three rooms – are known as Khrushchyovkas and represent a big percentage of total housing in Kiev today: 3,055 buildings that include some 211,512 apartments. The grim residential buildings embody Nikita Khrushchev’s logic and politics and helped solve the USSR’s housing crisis after World War II. They were designed for one purpose: to put a roof over the heads of as many people as possible, as quickly as possible. During the 1950s, in addition to starting the “thaw” policy and the process of “de-Stalinisation”, Khrushchev – to meet the needs of overcrowded cities – ordered the elimination of anything that was considered “excessive”. He proposed to build low-cost, low-rise and temporary housing for people who were supposed to move to better places once “true communism” was achieved. However, life played out differently and people continued to live there for years. We meet one such family, The Vyschnyaks. Nikolaij and Tamara have learned to live humbly with their legs half-bent at the foot of the kitchen table, which Tamara often uses to iron her family’s clothes. 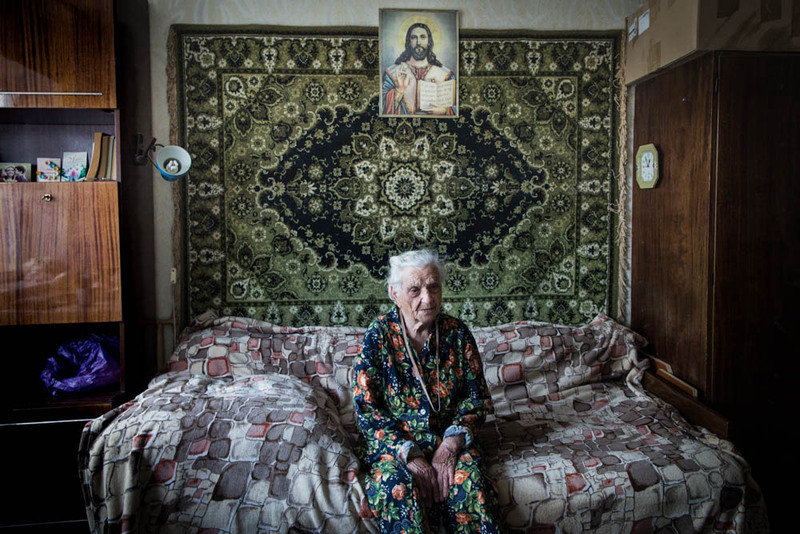 Both retired, they live on the fourth floor of a red-brick five-story Soviet-era building in the Darnytsya area, 20km from the centre of Kiev. In their 60sq metres apartment, there’s not much room for comfort. It is Saturday morning. Nikolaij, sleepy eyes and kettle in hand, pours hot water into the coffee cup while Tamara, shoulder-to-shoulder with her husband, prepares lunch for the five people living here: Nikolaij, herself, her daughter Anna, her grandson Bogdan, and Nikolaij’s mother Irina. “I don’t know where to place the dishes,” she says. “We can not have lunch here in the kitchen, there is no space.” For the Vischnyak family to have a meal on an old cart made of wood and brass – sitting on the sofa bed and improvised chairs in the living room – has become the norm. The rigid Soviet conformism, firm in structure and form, still finds its way into everyday life. The spaces, at first sight, separate and well defined – doors to close, walls to divide – have altered, merged, transformed. The living room became a bedroom; the balcony a bed; the bedroom a mini apartment; the kitchen a laundry, the window a showcase. There is no longer an inside and an outside; the near or the far. Space is liminal. For Nikolaij and Tamara, still together after 43 years of marriage, their morning chores, walks and refreshments in the afternoon – the private, the trust, the neighbourhood – is part of their everyday life. Everything is there. Irina’s 15sq metres room has become a self-contained apartment, combining living room, bedroom, and kitchen. In her eyes lives the fatigue of a woman born and raised under the intense rigours of various communist regimes. She stops for a moment to look at the portrait of her father, Gavriil, a farmer overwhelmed by the collectivisation of agriculture starting in the late 1920s, who was forced to work in a kolkhoz. The work also consumed Irina’s days between picking up cucumbers and wheat harvesting – every day, without any break. “Swallowed up there, 12 to 15 hours a day, under the careful control of a party official. If you resisted, you would be put in prison,” she says, recalling the tiredness, all the effort for little food, and frustration during the mid-30s, the period of Stalin’s reign, of purges. Anna sits on the balcony, her intimate space, barefoot, wearing a bathrobe and holding mascara in her hand. Every morning, the 43-year-old who works as a hairdresser, gets ready between pillows and woollen blankets piled on the floor, because a single toilet, for five people, cannot suffice. But to her, their apartment is more than enough. It’s an integral part of her childhood, her adolescence and her motherhood. It’s the place she calls home. She grew up in the 1980s, the era of Michail Gorbachev’s glasnost and perestroika when the Communist Party of the Soviet Union reformed the political system and society: greater transparency, less control, more freedom. “People began to talk and dress as they wished, information circulated freely,” Anna remembers as she looks out of the window, a cup of coffee in her hands. But life in Ukraine changed again when the “external empire” of the USSR began to crumble. It took the Orange Revolution in the aftermath of the November 2004 presidential elections for Anna to identify with the yellow and blue national flag. Protesting alongside thousands of people in Maidan Nazalezhnosti, Anna finally felt Ukrainian. Fifteen-year-old Bogdan is the face of the fourth Vyschnyak generation living in the Khrushchyovka. Every day, carrying a backpack and smartphone in his hand, he walks through the streets of Darnytsya area to get to school. Like his mother Anna, Bogdan was born in that neighbourhood. But as Ukraine is fighting a bitter war with Russia, that area, so visibly Soviet, begins to screech with his nationalist spirit. Almost five years have passed since the Donetsk and Lugansk regions in Donbass were illegally annexed by Russian forces.